Out of a desire to recapture the fond memories of freshman year, I decided to step up and be a Dawg Daze Team Captain. 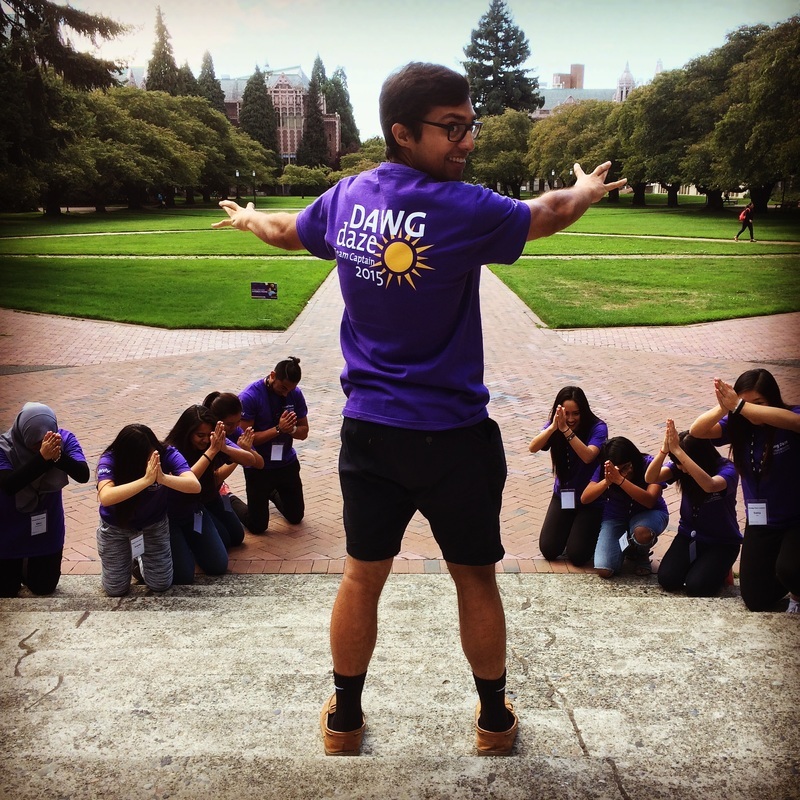 My transition to UW my first year was so easy, it felt like I had come home the minute I stepped onto the campus for the first time. A big part of this feeling came from the immense hospitality and warmth extended during Dawg Daze, and I wanted to be a part of doing that for the freshmen this year. It felt only right after calling UW my home for so long that I help usher in the next generation of dawgs with that spirit. I'm glad I had such a dedicated and responsible crew though, because once Dawg Daze began, it was like all hell broke loose. The main leadership lesson I took away from this experience was being adaptable. Almost nothing ever went as planned, and instead of becoming frustrated, I had to just roll with it. The greatest instance of this was coordinating the buses for our Late Night Fred Meyer run. That event felt chaotic when I was a freshman, but managing it was an entirely different nightmare. Getting the freshmen onto the bus in an orderly manner, making sure the process was as efficient as possible was the first hurdle. Then we had to get the buses to the Fred Meyer, and naturally the directions weren't the best and didn't account for certain one-way streets and other such fun obstacles. I take full responsibility for the crazy traffic jam we caused in Fremont that night, although since it was so late it wasn't really a big deal. But yes, adaptability was important for keeping my cool, especially when other people were changing up the plan. Going against the tide wasn't helpful at all, but when I was able to roll with the cards we'd been dealt without completely changing the plan, everything did turn out alright. We made several trips between campus and Fred Meyer, got everyone there safely, and had a ton of fun in the process. Another lesson was not taking myself too seriously. At the end of the day, all of our activities were about having fun, and I realized that as a leader, your primary mission has to always be at the top of your head. When I was having fun, when I remembered why I was doing the job, that's when things went the best. At the Late Night Breakfast on the Quad especially, it was sheer pandemonium at times passing out bowls of cereal, but my friend Yousra and I were yelling and dancing to the music (did a lot of dancing over the course of Dawg Daze, more than in my entire life) trying to get people to eat the yogurt from our stand instead of those of the other Dawg Daze leaders. There is a difference between not taking oneself too seriously and not being professional; the former entails retaining humanity and the ability to connect to those you are serving and leading, while the latter is being unwholesome and unapproachable. I loved being a Dawg Daze leader. I recaptured that sense of home that UW provided in those first few days, and that I got to share it with the freshmen made it all the more special. I made a ton of new friends, got a bunch of free t-shirts and UW swag, and had so much fun. It was the best way to kick off my senior year.